Tie dye bath bombs are a new take on spring inspired bath products. 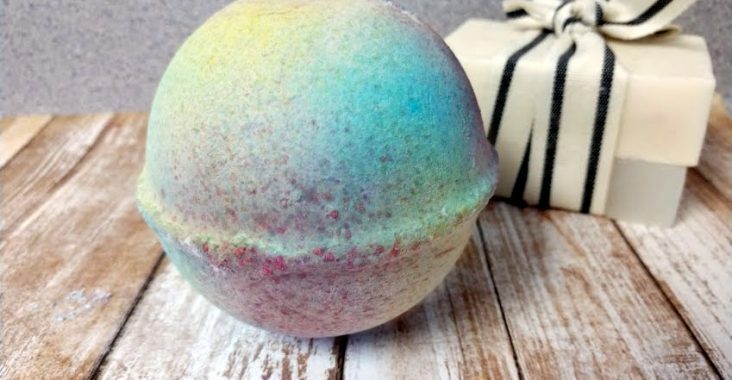 Take your bath bombs to the next level, especially Easter egg themed fizzers. This tutorial is simple and is extremely open to customization, and it is easy to do on a large scale. 1 ounce bottles with sprayers that fit. Pour a 2-1 ratio of alcohol to colorant into the 1 oz. bottles. With rubber gloves on, spray the bath bomb liberally until you achieve the look you want. Let the bath bombs dry 24 hours to ensure your hands won’t be stained when grabbing them. Hold up a stencil to the bath bomb and spray the colorant alcohol mixture to leave a gorgeous design. Just make sure to properly cover the portion that the stencil doesn’t cover. You can use plastic wrap or a paper towel. We tested wrapping the bath bomb in a paper towel, and then spraying the colorant alcohol mixture onto the paper towel. However that did not work the best, the colorant stayed on the paper towel. This method can be used for any shaped bath bombs, they don’t have to be regular shaped. It Makes any bath bomb pop with character.